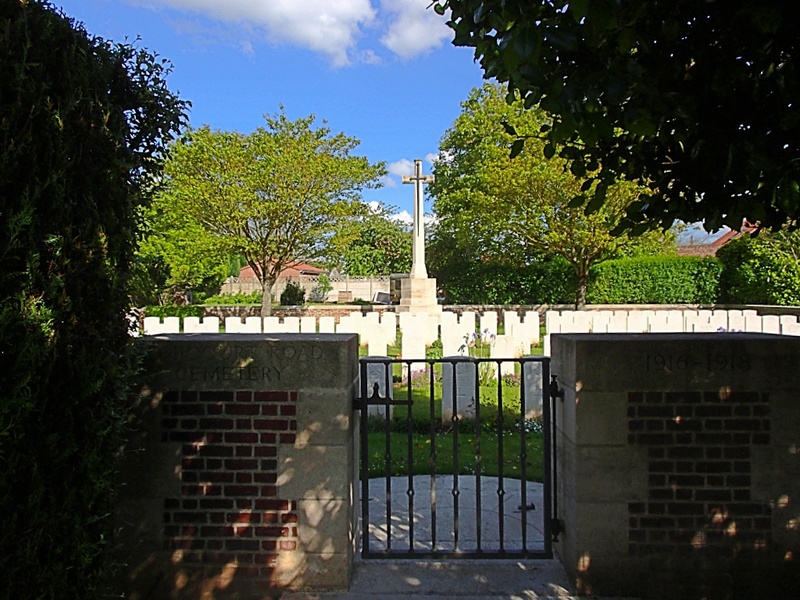 Achicourt Road Cemetery is 2 kilometres south of the centre of Arras and is on the east side of the road to Amiens. 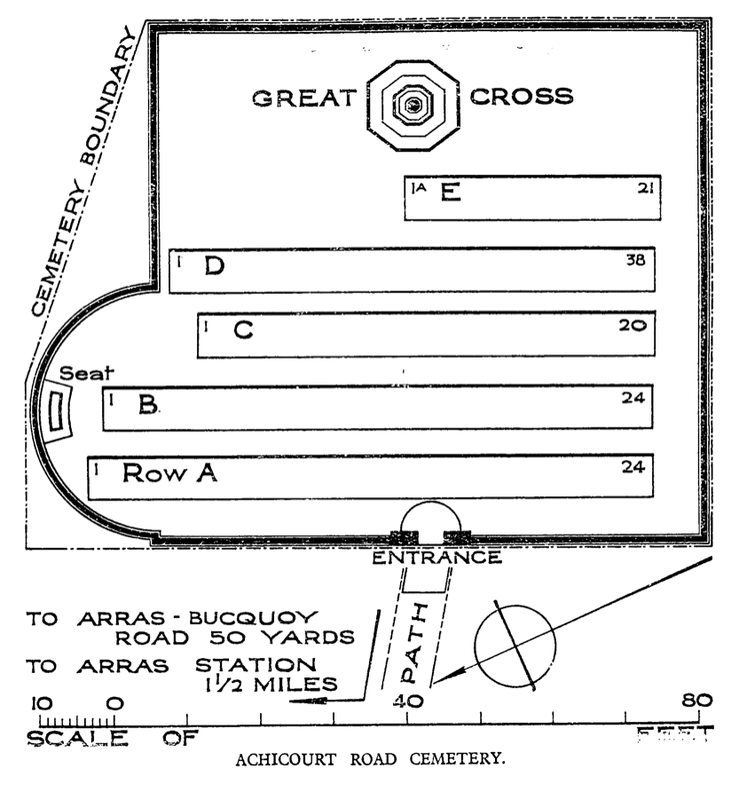 The cemetery is located at the crossroads D919 Arras to Bucquoy and the D5F Beaurains to Achicourt, which is now part of a new roundabout. 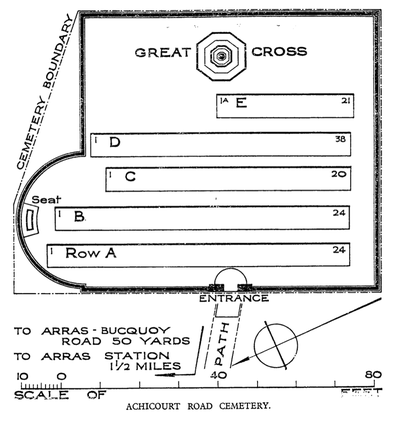 The cemetery is about 50 metres off the roundabout on the righthandside going towards Arras and a CWGC signpost is erected on the pavement. Access to the cemetery is by a turfed chemin d'access between allotments and houses. The cemetery was begun in March 1917 and used until June. The graves of these four months are in Rows A to C, and the majority are of officers and men of the London Regiment. The cemetery came into use again in August and September 1918, when Rows D and E (mostly Canadian graves) were made. 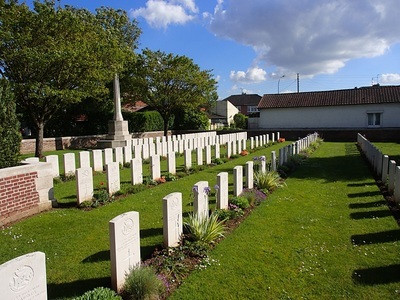 Graves, from Achicourt Churchyard Extension, were added to Row E after the Armistice. Achicourt Road Cemetery contains 131 First World War burials, eight of which are unidentified. 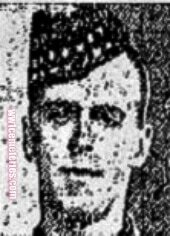 492050 Private, James Mayers, 1st/13th Kensington Bn. Royal Fusiliers, executed for desertion on 16th June 1917. Row C. 11. Son of Mrs. M. E. Mayers, of 193, Morning Lane, Hackney, London. 474371 Rifleman, Walter Yeoman, 1st/12th Bn. London Regiment (The Rangers), executed for desertion on 3rd July 1917, aged 22. Row B. 16. 29th August 1918, aged 29. Son of Andrew and Maria Rose, of Aurora, Ontario.